Wow! You ladies had some FAB ideas for guesses! I especially loved the petal apron idea. Seriously, how cute would THAT be? I'm working on that as soon as I have a minute to play!! And two ladies DID guess right. I suppose I'm not too good at being sneaky. LOL Hollie and Anna Maria knew just what I had up my sleeve: Fun little stuffed patchwork Easter eggs! So fun, right?! My kids LOOOOVE them. And I think they're quite adorable too. 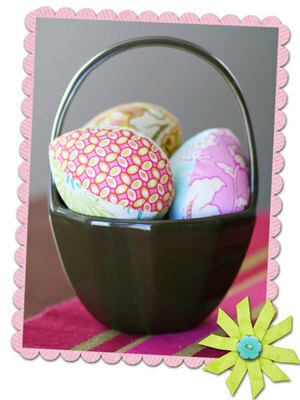 Thanks to Miss Heather Bailey's gorgeous fabrics that work so perfectly for spring time projects. So I worked up a little pattern if you'd like to make some for yourself. Please forgive my weak pattern attempts....I'm no good at drawing in Photoshop....and even worse at writing instructions. Anyhow, here's how you do it. To use this pattern, click on the image to make it larger. Save the full sized file to your computer and scale it to whatever size you want, then print it out. The pattern I used to make the eggs pictured above was 6 inches in length, if that helps at all. :) I know, clear as mud, right? Okay, friends, off to do a little shopping and birthday cake planning. It's *Henry's* birthday tomorrow so we've got a busy weekend full of celebrations. "I'm no good at drawing in Photoshop" UH what? Looks wonderful to me! Can't wait to put this in my pile of things to try! Turned out completely darling, LIKE YOU. Ooh! Love those! Thanks for sharing the pattern, Kim. I'm in desperate need of Easter decorations and those would be perfect! Now, off to choose some yummy fabric to make them with. . .
OMG Send that over to Heather! Those are adoooorable Kim!!!!!!! Oh Kim, you are so darn talented! Look at those eggs will ya? I wish I knew about these a month ago.... they would have been darling in the shop. SO~ whatdaya have up your sleeve for the next holiday (4th of July/summer?) love your blog. Oh Kim, these are just adorable. I just might have to make me some. I thought you did a great job with the instructions. Seemed clear to me when reading them. SO SO Cute, Kim! Great job! Totally adding these to the to-do list! Happy Birthday Mr. You Know Who!! Adorable! These are going on my project list!! Thanks for the pattern! they're great! You should seriously charge admission to view your blog! Well, except me, of course! LOL! Super Chic! Those are tooo cuuute:) I just love those fabrics too. kim you blow me away girl! you are sooo creative and these eggs are the cutest!! you make me wish i knew how to sew, and i don't know thing one about a sewing machine- and i have one too! ohhhh, so henry was born on st. paddy's? too cool! have fun! Look at those adorable eggs!! 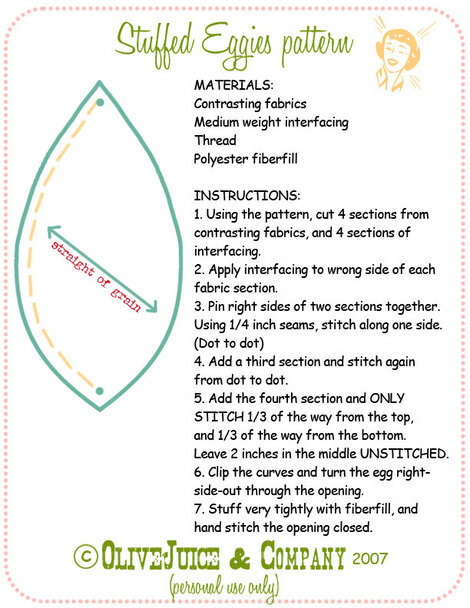 And the pattern/instructions is just as adorable! You are so good! Enjoy the birthday cake! Oh YAY for me-woohoo! Wow I'm doin' the happy dance just cuz I guessed right-LOL. How goofy is that? I can't even sew! But I do wish I knew how. These eggs are just adorable!! Love them! Maybe my SIL can make them--as long as I get to choose the fabrics-hehe. Well she has okay taste I guess:) And I guess I should manage to put my blog link with my name now, shouldn't I? We'll see if I can figure that out:) Have a great weekend! Oh yeah and I made the scones--came out soooooo yummy! Brilliant idea! I will definitely make some and share a photo with you when finished. I've never outgrown Easter Eggs! Don't plan to either! HA! Thanks for the cute pattern! Now I know what to do with all my scraps (which I've been hoarding "just in case")! Adorable Eggs! So creative you are! Now I just wish I could sew! what an awesome idea!!! I can't wait to try it out this week!!! :) :) :) Thanks!!! Your eggies are too sweet! I look forward to trying that pattern out. You are so funny! I took Home Ec in middle school, did my bout with sewing, HATED IT, and I continually wonder what kind of mutant I am because all of the women in my family are fabulously creative with a needle and thread. But then I read your blog and allow myself to wander over to the dark side. :) Maybe sometime in the future....eggs don't seem to hard, eh?